Pet Trex Playpen offers tool-less setup along with strong lightweight metal panels and affordable pricing. It also comes in two different sizes – 24 inch and 30 inch high. Read on to find out more. 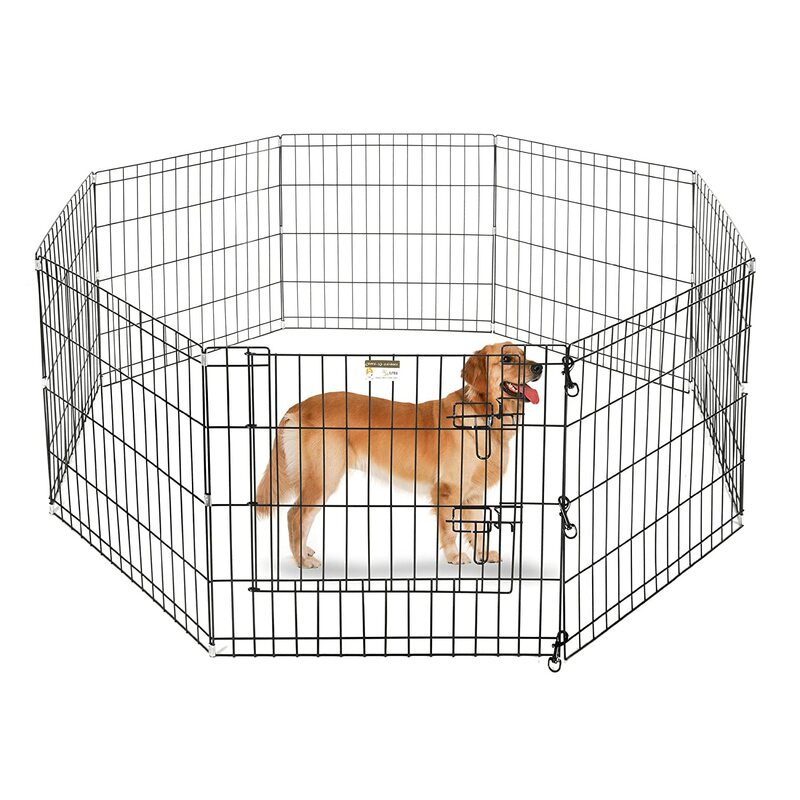 For many years pet owners struggled with the process of setting up a playpen. It may sound like an easy job, but if you have done it before, then you know how hard it can get. The panels, the screws, the hinges and million other things to look out for make setting up a playpen really hard. But not anymore with Pet Trex Playpen, please see the image below – it has simple latches and hooks and that’s what I love the most. Another annoying thing is the weight that metal playpens carry but thank God not Pet Trex Playpen. I know these reasons collectively drove pet owners crazy when setting up a playpen both inside and outside their homes. Pet Trex Playpen considered these drawbacks of metal playpens and created a solution. A solution that soon became the go-to playpen for pet owners. What Pet Trex did was to opt for a tool-less design coupled with lightweight construction. So, you will be able to move it around with no difficulty at all. That’s an advantage when you want to use it for both indoor and outdoor use. Just fold it, store it anywhere or take it outside when you wish, as shown in the above image. 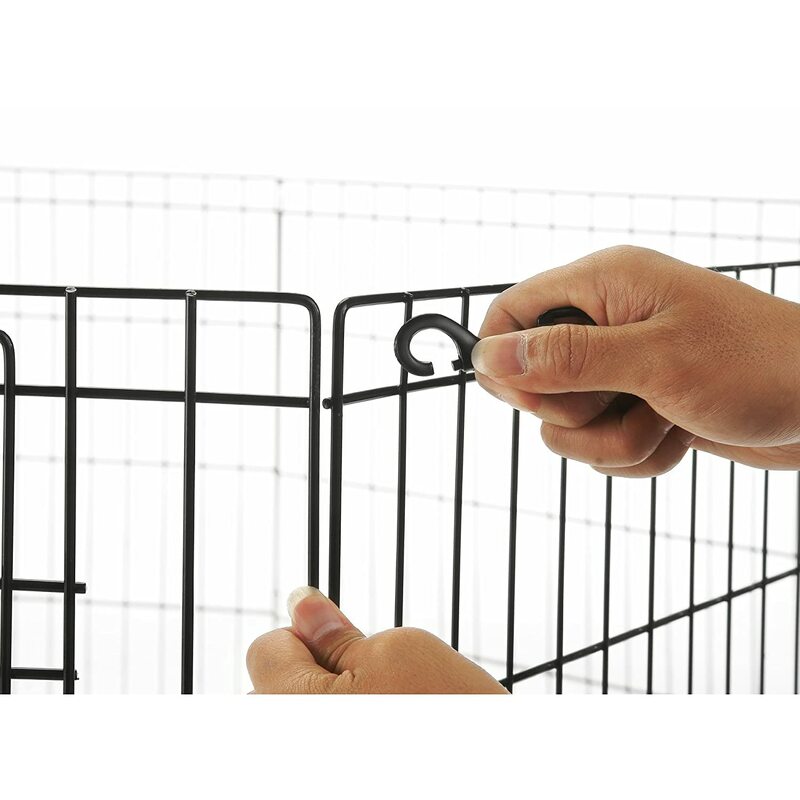 Moreover, one of the panels also provide a small gate or “doggie door” through which you can easily let your furry friend inside and outside the playpen. The easy to use latches also lets you secure the door. Also, there aren’t any small parts, which can be easily lost. You can simply unfold the playpen as the hinge mechanism is built-in, if you want the playpen to be erected outside or inside, it will only take you minutes. It is highly commendable on how they managed to keep everything neat and tidy. 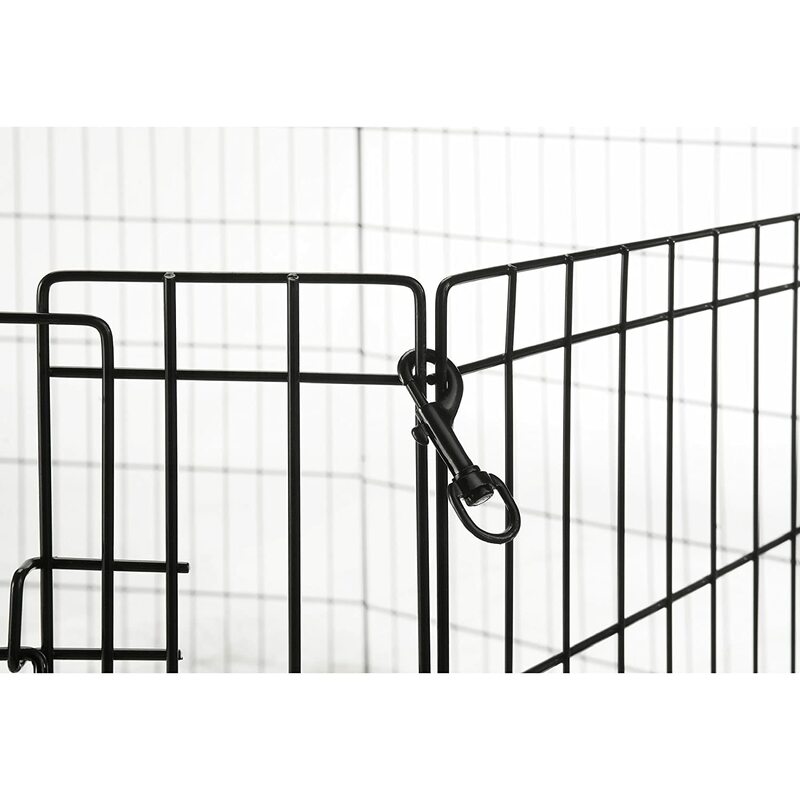 Also, I love the rounded edged wires, which makes your dog’s safety a priority. Pet Trex advertises the playpen being made of heavy gauge wires. You can trust them on this as the construction is really sturdy for a lightweight product. You don’t have to worry about the wires being bent or them coming apart. One can actually see the confidence the company has in their products as they provide 1-year warranty for the product. I think the satin black electro-coated paint contributes a lot to the build quality as the paint makes the whole thing rust resistant. Also, electro-coating is one of the best ways to adhere paint onto metal giving it a seamless finish all around. 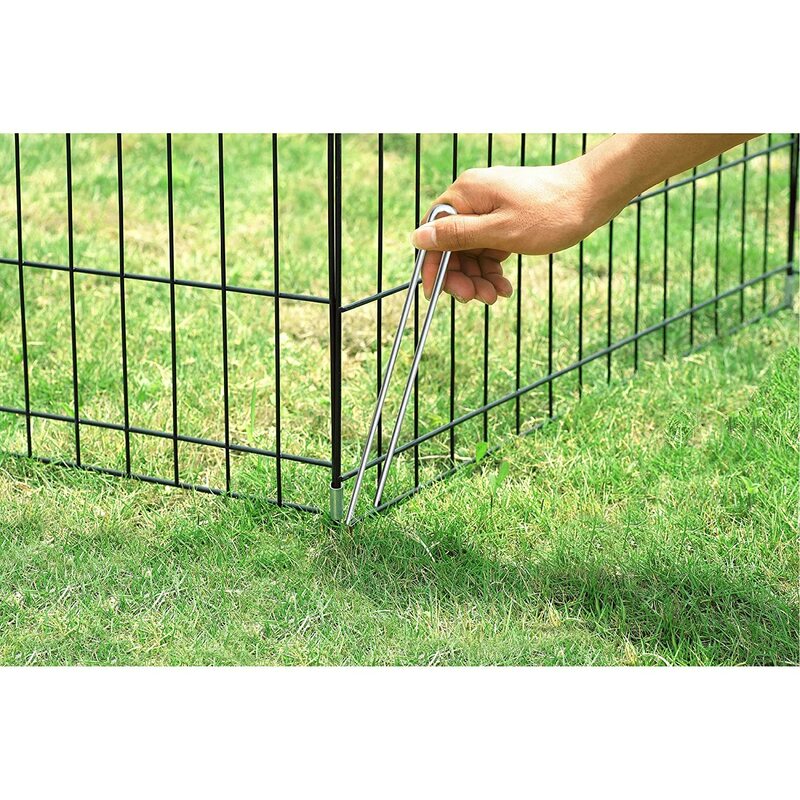 With the included ground anchors and corner stabilizers, you don’t have to worry about your pet messing up the construction while they are kept in the playpen. This makes Pet Trex Playpen stand out from the rest, mainly the amount of detail the designers have put into this product with the aim of tackling real-world issues. The open ends of the playpen are joined by two pressure clip that holds everything in place. Simply collapse the frames after the locking mechanism is set free. Now you have a 24” x 24” lightweight rectangular box, which you can easily store it as well as carry it around while traveling. The 24” x 24” panels also open up as a wide variety of shapes that you can create. Octagon, rectangle, and square being primary examples. As mentioned before, you will also have the option to buy the 30 inch high Pet Trex Playpen, which is suitable for dogs weighing up to 40 pounds. Missing Parts: Some users have complained about the product not shipping with the complete list of accessories. If you ever have such an experience with this product, you can easily opt for a return as the purchase is verified through Amazon. Sturdiness: A small percentage of users had issues with their dogs flexing the panels. Remember that the manufacturer clearly says it’s for pets that weight under 25 pounds. 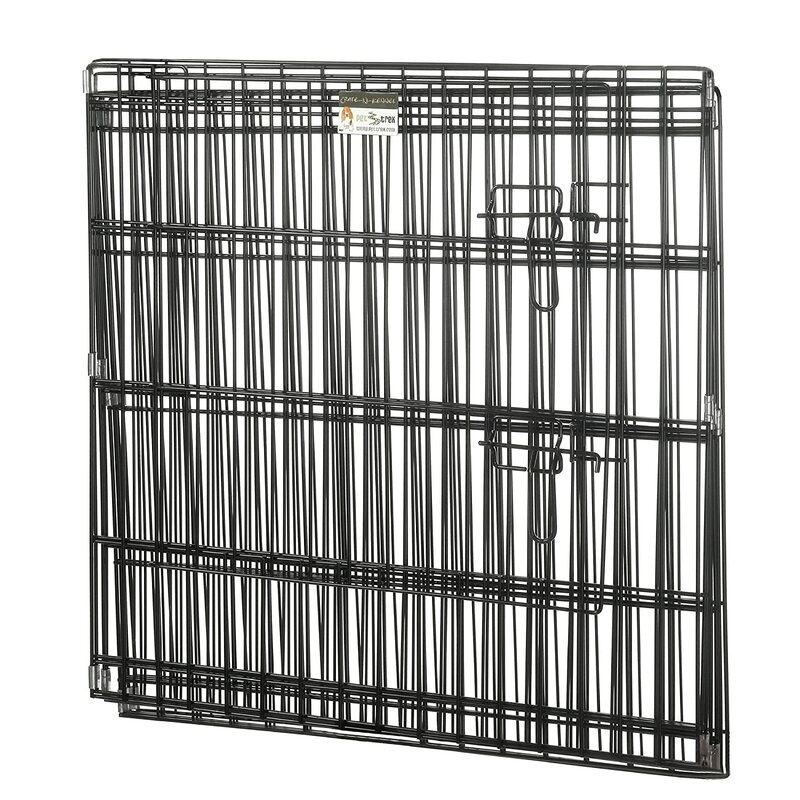 Not for Aggressive Dogs: If your dog is not well-trained or has behavior issues this may not be the sturdiest playpens. Remember, this is not a cage to hold Lions. 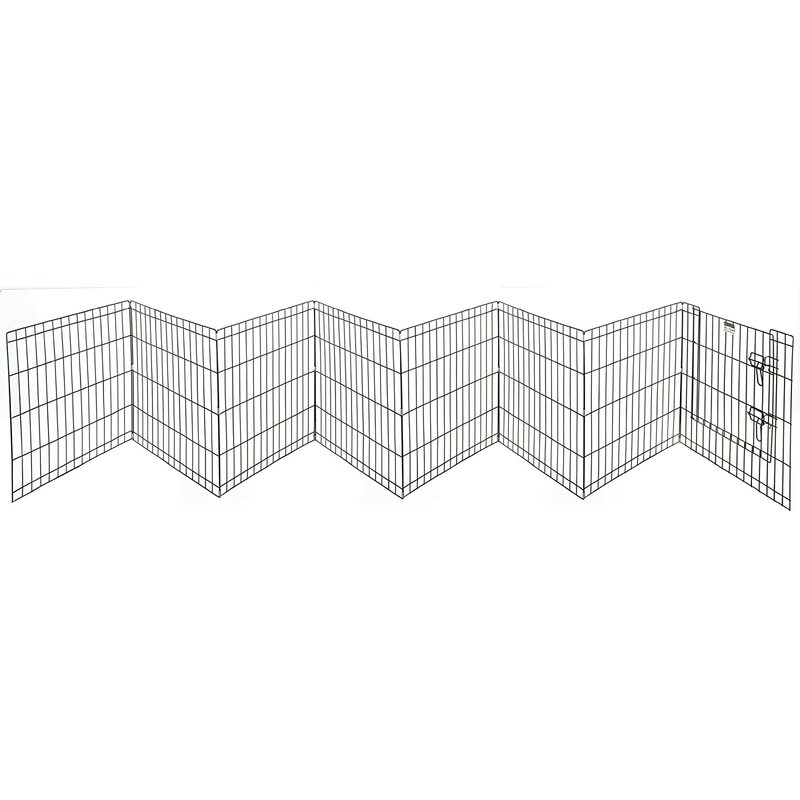 If you have larger dogs, then a more heavyweight metal dog playpen might be required. Overall, the Pet Trex Playpen gives the benefits of a well-made playpen without the hassles that come with conventional metal or wire playpens. Especially, if you are the person like me who gets confused with a million instructions on how to erect a playpen, Pet Trex Playpen presents itself as the best choice for you. If you want to find out more please head to Amazon and read the reviews there. 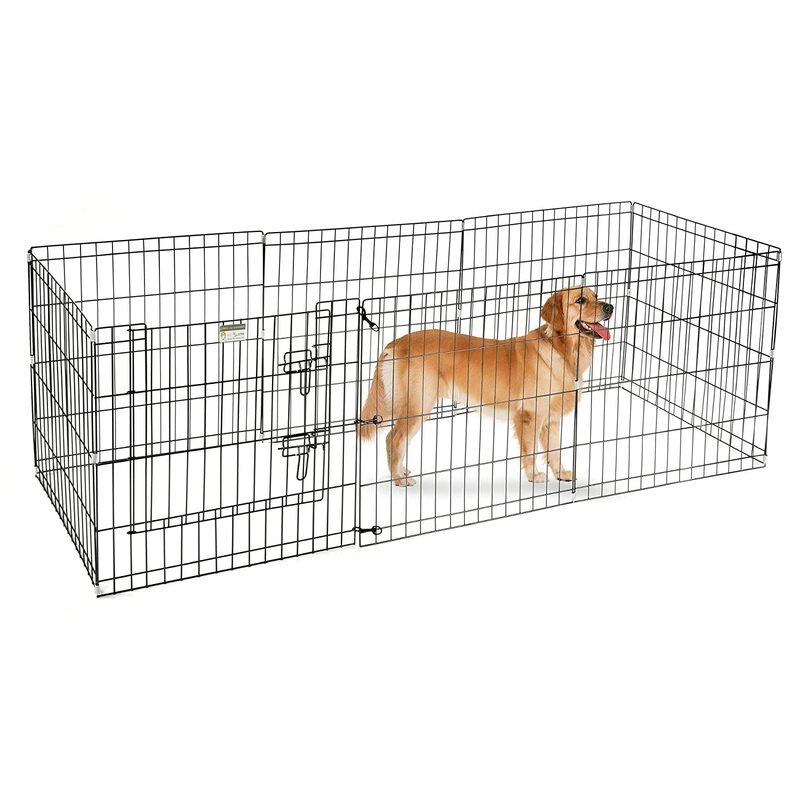 (1) Dog Playpens are useful – read the other reviews here.